Hello from Scotland! I’m visiting with the supersweet Debby Hughes right now – oh my GOSH I’m so excited to get to see her on her home turf! I thought I’d take a little Scottish inspiration from fabrics for today’s project. I looked for ideas on the internet – and wanted to figure out something to do with those patterns in watercolor, since I’ve been in watercolor mode preparing for this trip. Today’s video shares the results – using some masking fluid and easy waterocloring to make 2 versions of a fun soft watercolor background! Watch it below or click HERE to see it in HD on YouTube. I think I like the argyle better til I look at the tartan….then I’m sure I like the tartan on the smoother side of the Strathmore. Then I like the argyle better for the way it came out so soft where colors mix…oh man. I can’t decide. Can you? Do you have a favorite kind of watercolor background that you like to make? Love this technique! I hope you enjoyed the Stirling Castle (my clan’s place!)! This is beautiful! I could see changing up the colors a bit to make it more masculine; always need ideas for those masculine cards. I don’t do a lot of watercoloring, per se, so I tend to keep it simple for skies and hills. I’m inspired to try this technique. Praying your cold symptoms don’t escalate and loving both looks. As always, amazing technique! Thank you. Oh beautiful Sandy! You always make things look so easy! Fabulous idea for inspiration. I can’t wait to see what you bring back for us from your European trip! 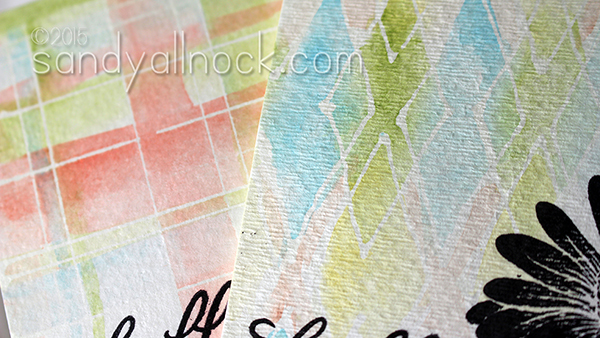 The plaid and argyle backgrounds couldn’t be more perfect for a post from Scotland! Keeping you in my thoughts and hoping you are able to fight off that cold…argh! Holy watercolor, Batgirl, these really are lovely. Need to get that fluid. Also, lucky duck, younget to spend time with one of my favorite cardmakers/photogs, Debby Hueghes. Wish I were there. Hard to pick a favorite–they are both beautiful! My heritage is Scottish so I’m envious that you’re in the land of my “people.” Thanks so much for your thoughtfulness in setting up these blog posts while you’re away. Coming to your blog is always a bright spot in my day! Oh, Sandy, these videos are amazing! I love each one – and would love more! I am of Scottish decent and love tartans! I know you are having a wonderful time traveling and painting, and I can hardly wait to see what you will have for us on your return! Hugs! I love your watercolor cards. Great colors and thank you for all the tips. I am looking forward to receiving my masking fluid to try this technique. I like the tartan better. Hoping that you stay well. Nothing worse than being sick on vacation. No, don’t be sick! Prayers sent. As for the cards, they’re both pretty, but I like the argyle pattern better, but I like the smoother look of the tartan. Looking forward to seeing what you and Debby come up with during your visit. Both are very pretty, but I think the tartan is my favorite. gorgeous cards..I so hope the cold bug doesn’t get you…. Oh, wish I could be in Scotland right now, looking over both of your shoulders. I think I prefer the tartan one. I think the main reason for this is that you touched up the black floral image on this one, which makes it stand out more against the soft background.